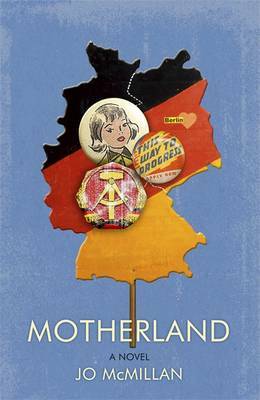 Jo McMillan’s debut has an unusual subject for what is essentially a commercial novel: life in the 1980s German Democratic Republic as seen through the eyes of Tamworth’s only deeply committed Communist and her teenage daughter. That alone would have been enough to catch my eye but two trips to Berlin, where commemoration of the Wall is very much more in evidence than the Second World War, made it all the more interesting – that and my own Cold War teenage years. The novel takes Eleanor and Jess from 1978 to 1984, several years before what Jess had imagined as ‘a low white wall’ was brought down. Eleanor’s cries of ‘The truth, the whole truth and nothing but the truth! Morning Star!’ fall on deaf ears every Saturday in Tamworth’s shopping precinct, although the butcher becomes exercised enough to wave his bloody cleaver at them most weeks. Eleanor thinks the best of everyone. From a long line of political activists, she and Jess spend much of their weekends collating the minutes for the many organisations she supports. The demands of the cause fill all of Eleanor’s time but she’s lonely and thanks to her mother’s unswerving commitment Jess is a social outcast. When they’re visited by a man who seems suspiciously well dressed for a fellow traveller to Jess it seems that Eleanor’s dreams have come true: she’s to fill the gap left by an English tutor on a summer school in East Berlin. Once there, she’s ecstatic, throwing herself into life in the GDR with abandon, and developing a crush on the widowed Peter which develops into something else over the next few summers as their visit to East Berlin becomes an annual event. Sadly, dreams of a family life in the GDR are scuppered by a cruel directive. Still embroiled in Party machinations, Jess begins to understand that things are not as rosy as she once thought in her mother’s promised land. There’s a great deal of humour in Motherland, all underpinned with a sober tone – these were unsettling times, after all. Those of us who lived through them, like Jess, wondered what we‘d do in the minutes between the early warning siren sounding and the attack. She, of course, would have been on the other side. Eleanor’s relentless efforts to put right the wrongs of the world are both endearing and funny. Even collecting a takeaway is an opportunity: ‘While we waited, my mum could chat about British colonialism and say sorry for all the things we’d done’. Jess makes an engaging narrator, at first an eager follower of her mother then gradually dissecting what lies behind the GDR’s façade of unity where everything is done ‘togetherinagroup’ but where ‘your friends can become your enemies and your enemies your friends’. As Jess grows into maturity her understanding of the world overtakes her hopelessly idealistic mother’s. You’re left wondering what will become of Eleanor when November 1989 arrives and the Wall – with all it symbolised – was pulled down. I’m sure she would have been appalled at the prospect of a museum dedicated to life in the GDR, one of the best I’ve visited in Berlin. An unusual novel, then, and not entirely divorced from McMillan’s own experience, apparently. She was, indeed, Tamworth’s only teenage communist although I hope the resemblance between her own story and Jess’s stops there. This entry was posted in Reviews and tagged British Fiction, Cold War, East Berlin, German Democratic Republic, Jo McMillan, John Murray, Motherland, Tamworth on 3 July 2015 by Susan Osborne.